These dogged references to crisis-year 2009! It’s been going on all year. In the first half, it was the energy sector. But more recently, Big Tech and others jumped into the fray. Biggest sinners this year: HP 30,000 (laying off people through thick and thin is what it does best); Target 17,000; Schlumberger 9,000 in January and another 11,000 in April; supermarket chain A&P 8,500; Microsoft 7,800; Baker Hughes 7,000; and down the line, including CAT a week ago with 5,000. The energy sector is still number one this year with 72,708 job cut announcements. Retail isn’t far behind with 68,871, the computer industry with 58,874, and industrial goods with 44,057. These are just the largest employers with big announcements that make it into the report. When a smaller company lays off 20 people, it doesn’t show up anywhere, unless it’s a startup in the “unicorn” club with a “valuation” over $1 billion. Then the media drool all over it. Evernote, which raised a total of $302 million by May 2012, with the last round giving it that glorious $1 billion “valuation,” announced its first layoff in January, and its second a couple of days ago. Because it’s a formerly hot startup, it made the news. But a small manufacturer quietly laying off 100 people might barely make the local press. So now we get today’s “ugly” jobs report. It wasn’t the end of the world, compared to the end-of-the-world jobs reports in 2009. But there was a trend that, if it continues, is truly ugly. More on that in a moment. The economy added only 142,000 jobs in September, according to the Bureau of Labor Statistics. June and July were revised down by 59,000. Hourly wages edged down 1 cent, so not the end of the world either, just the continuation of a sad theme. Average weekly hours also edged down. Manufacturing shed jobs for the second month in a row, as we knew it would [read… US Manufacturing Recession Draws Eerie References to 2009]. But the headline unemployment rate remained comfortably at 5.1%, in part because the participation rate dropped to just 62.4%, the worst since 1977. Over the past couple of years, there has been a trend in the employment numbers that was at first hard to see due to the volatility of the monthly data. But now the trend has come into full bloom: the deteriorating growth of the number of employed people in the US has turned into shrinkage. Back in 2013 and parts of 2014, the monthly increases were substantial, if volatile, but then started waning. By July 2015, there were 148.84 million employed in the US. In August, there were 149.04 million, up 196,000. But in September, the number of the employed plunged to 148.8 million. According to this report, there are now 236,000 fewer employed than a month ago. It doesn’t exactly corroborate the headline notion that 142,000 jobs have been created, even as the number of employed shrinks. Was it just a statistical quirk, something that will reverse with flying colors next month? We hope so. But beyond this hope, there is the two-year trend, and despite all the ups and downs and the month-to-month volatility, the trend is starting to crystallize. If this worsening trend continues, it would be truly chilling because the Fed still has the interest rate at near zero, along with nearly every country in the developed world, and QE is still the standard in Europe, Japan, and elsewhere. Central banks have kept their monetary foot on the gas pedal and floored it for seven years straight. Governments around the world, including in the US, despite all the hoopla about “austerity,” have piled on historic amounts of debt at dizzying rates in the greatest global stimulus package of all times. And yet, the US economy might be dropping below stall speed, with employment showing signs of deterioration, while asset prices, after seven years of “wealth effect,” are teetering precariously at ludicrous heights. The risks that the Fed promised it would banish from the globe are suddenly returning with a vengeance. ← Argentina Forces “Pesofication” of Dollar Assets – to Avoid Bond Payment due Monday? 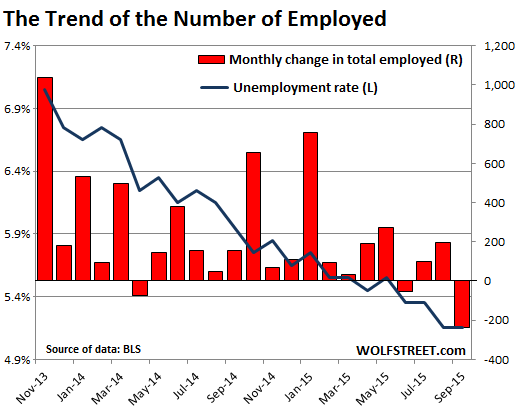 The job report is dismal and yet somehow there’s a massive rally virtually across the board. The whole thing reeked of an orchestrated short squeeze. Kilgore is misleading. Share buybacks have not come from retained earnings, which have been shrinking, but from borrowed money at extremely low interest rates provided by the FED. While laying off tons of people, companies are gleefully buying back their shares like they had unlimited bank accounts. While most economic and technical factors are pointing to a stock market decline, the market went up this week. Why? Probably based on the mainstream thinking that the FED will not increase interest rates based on the jobs report. And what are those 300.000 ;aid off workers to live on, now that they lost their weekly wage? Unemployment? That’ll pick up the GDP, right? Monetary policy doesn’t do anything. Custody of assets is shifted from the private lenders to the central bank. In return, the lender is given credit in its reserve account. No ‘real money’ (liquidity) changes hands. The excess reserves are only deployed when there is a redemption claim made against the lender … as during a bank run. When that occurs, the lender’s balance sheet collapses, there aren’t sufficient reserves and the lender finds himself underwater. Central banks cannot raise interest rates by themselves. To raise rates to 2008 levels, the Fed would have to unwind its entire balance sheet … presuming there are buyers for the Fed’s assets. The central bank would be forced to sell at a discount … not only would the Fed lose billion$ — denting its prestige — it would also have to make up its losses by borrowing from the same banks it is trying to sell its bonds to! All the QE/ZIRP/easing talk is just that, talk. Central banks are irrelevant. Interesting comment. Since the Fed is “public, private, and non-profit-seeking” so to speak, you don’t think the Fed letting the junk they bought roll off their balance sheet (i.e. hold to maturity), rather than re-investing, is a strategy? I get that in a mark-to-market world their assets tank as rates go up, but since they are a critter of an odd nature it seems to me that the reversing of the book keeping entries would dig them out of their hole. To be clear, this is QT (quantitative tightening) and reverses QE. At that point, only the assets that became non-performing would be the issue as those losses would eat into their capital base. But to do this, they can’t constantly be taking on new assets (QE). I don’t have a horse in this race, but I was really expecting them to keep up with the jawboning, leakboning, glitchboning, and lieboning rates low(er) while not actively (desperately) trying to avoid absorbing new assets. I kind of felt this was their strategy. And this worked for a while, but things are going south fast. Rates can’t go back up (in the Fed’s mind) because it would blow up all the other entities that loaded up (with leverage) at low rates. The bond complex would have serious bag holders, at which point they are back to square 2007/8 (QE-to-INFINITY) except this time with a bloated balance sheet and zero bounded rates. Plus, at this point, they HAVE to know it won’t work. They are just going to pick winners and losers this go around, and I think Yellin is figuring that out. DISCLOSURE: Long Treasury Direct and Safe Deposit Boxes! Cooter, the Fed doesn’t pick the assets it buys, the FRBNY’s Primary Dealers do the picking. In other words, the Fed gets loaded up with the Primary Dearers’ banks liabilities. Here’s a list of the Primary Dealers, none of which would be mistaken for modern day Robin Hoods (more like robbing hoods). I get they are a bad bank, but I was just working through the logical exercise. I remember MaidenLane/etc and it was down hill from there. But my argument stands. I think they can roll off a good chunk of it (at least at current levels), but there is a lot of rot which puts their base capital at risk. And then things can go downhill from there. I haven’t seen a Fed balance sheet post for quite a while. ZH comments are sadly too full of trolls/morons, although they have great content and I visit them daily. The crowd here is much more composed. So for now I post here more than there, at least at this level. I agree with that. Fiscal policy is what matters, not interest rates on money. Interest-free money keeps big business going, but that is increasingly unhooked from anything relating to the man in the street, because that money is trapped in a vortex. Our economies suffer from a lack of aggregate demand, i.e. 90% of people don’t have enough money to participate in this economy. They can’t buy anything because they are tapped out after paying for food, housing, and a car. A universal basic income is one way of solving this, and a wide, wide array of other social problems. See http://www.reddit.com/r/BasicIncome for discussions of this topic. Deficit spending is what we need, we need the entity with a monopoly on the currency (the government) to issue more of it. And to make sure that it circulates within the actual veins and arteries of the system — that is, give it to everyone, and not just to the C-suite guys or military weapons research. If you can’t believe in that, at least give it to fund startups and new businesses — businesses can’t survive in this climate where the man in the street is pressed for every cent. You have to be the next Facebook just to make ends meet, its stupid. The problem with replacing humans in the production lines with robots is the end game where there is no person has the ability to purchase the production because the benefits of robotization go to the asset holders and CEOs and not generally distributed. There is what is called inflation and what ‘they’ seem is a decent level to shoot for, and there is the real inflation that people experience daily (rising food prices, etc) and cut back spending to address their reality, accordingly. Adding to that virtually no wage increases, poor employment prospects, and a corrupt oligarchy running the country…..the peasants will and do hunker down. We’re all peasants or fodder to the rulers. Sheep to be fleeced, but there isn’t much left to take beyond the cry to reduce food stamps, medicaid, social security, and impose wage reductions on as many as possible. At least Scott Walker called it quits. Working people are safe for awhile yet. yep, the rulers are all insane! They want rising wages and incomes so the workers can purchase more and more goods and services so the rulers can take a cut of a larger and larger pie but then at the same time, their greed has them reducing jobs and incomes so they can maintain the size of their take from already diminishing pie size due to them already taking more than they should. It is an impossibility to give 8 or 9 or 10 Billion A-holes a 50,000 dollar a year job! There are too many A-holes on this rock and with automation happening in the work place those job numbers will continue to worsen year after year until you have half of the population working and the other half sitting at home on social assistance programs that will literally bankrupt nations. At least, the population will start declining by mid century if WW3 doesn’t clean them out first. As a business owner why should I pay someone 13 dollars an hour when they only put in about 1-2 hours of ” real ” work a day. Even my sister who makes 100,000 a year working for the Federal Gov’t admits that she only puts in about 2 hours of work a day. A lot of you people out there who have never owned a business or had to deal with employees have no idea what it’s like to deal with them. Give me a robot and a 3-D printer any day of the week. If anyone hasn’t seen the episode of Star Trek Deep Space 9 Season 3, where they go back to the year 2030 and they have put up walls to keep the poor people away from the rest of society in urban areas, go watch it.. We are headed in that direction. MAS, you’re awfully negative when it comes to people! I’ve run several businesses, and I’ve had my share of problems with employees, but I tell you, these people were the reason why I enjoy going to work. As manager, putting your team together is your number one job, unless you want to do everything yourself. You might as well surround yourself with competent people who are (mostly) good to be with. Well, to quote from Ambrose Bierce’s “Devils Dictionary” Distance: The only thing the rich give to the poor to keep for their very own. I think David Stockman had a real eyeopener of a chart that compared hours worked today versus 15 years ago and there was no real increase. “Jobs” has become a fairly empty term as one $50,000/year job can be divided into 2 part time jobs that pay $25,000 or less. The methodology used to ‘count’ jobs is also suspect and subject to manipulation. Birth/Death models and surveys conducted by the Census! Bureau in an era where 100 million bank accounts are updated instantly to reflect current balances. If you are legally on a payroll that is going to show up on any number of data bases. The IRS requires it. If you are legally self employed the same thing applies if only a quarterly basis. Were the US government really interested in compiling and releasing accurate up to the minute employment/earnings data they could do it but it would be politically toxic. Geez MAS, no wonder you have such poor productivity from your ‘workers’. If you think they are assholes they will meet your expectations. I have run a few businesses. Silly me, I have always believed that most people want to do a good days work and have paid them accordingly. I was seldom disappointed. Maybe it is time for a mirror check. If they don’t respect you they won’t work for you. If they dislike you they will actually try and sabotage you. As for $13/hour, it is an insult. What can you do with $26,000 per year? You won’t be able to get by on it that’s for sure.!! You know the old adage. “You pretend to pay me and I’ll pretend to work”. That was an adage of the old Soviet Union and a very accurate indicator of the mood of the people then. As for automation and robotization, it can only function if you have some kind of socialist style distribution system. It cannot possible work under traditional Capitalism. We are headed for a world where it is no longer goods that are scarce but meaningful work. The rules are changing drastically. This would only apply to basic goods. The luxuries of life are quite another matter. You can’t socialize Cadillacs and fur coats and vintage champagne. That will be the fruit of good old fashioned free enterprise. I suspect people will be willing to work hard for the goodies of Life. I don’t think you need to threaten them with starvation and homelessness the way they thought in the 19th Century. Jobs doing what? There’s nothing more to do. Think about it: do you have an urgent need to hire anyone? You HOPE for “better employment data”?? The BEST thing that can happen is for DISMAL data…the faster to bring down this dysfunctional, unethical, crony-stuffed, immoral farce of a rigged, manipulated, over-regulated Potemkin economy to an end. ‘This year, we have had the worst wildfires in California’s history. One reason for the severity of these fires is the ongoing drought and the especially hot summer weather. However, another and far more interesting reason is that we are just too good at fighting fires. The reported unemployment rate is bogus. The reason the unemployment rate has gone down is so many people have dropped out of the workforce and are no longer counted. If the long term unemployed were counted, unemployment would be 4x what they report. They just want to report good news. Does anyone on the ground really take these numbers seriously anymore? Fact-based investing is a fools’ game. For those not directly below the money spigot, fundamentals-based portfolio enhancement is the unicorn. How much useful product or service is created by people whose output is not captured in the jobs statistics? For example, I built my own house while “unemployed”, but the house got produced. Missing was the usual complement of measurable tradesmens’ inputs. My wife was a “retired” public school teacher, not in the measured workforce, but she thereafter taught many a student how to play the piano in our home. Ya know, I am not a brilliant person, but the people here totally miss the point on just about everthing. We have had a severe pushing forward of growth and greed over the last 30 plus years that has not been or will never be addressed. And that is a sad commentary on our society in general, both politically, corporate, and individually. I was a working stiff taking care of sick people and have paid off my home, cars, and have no debt. But I am still working hard taking care of a severely disable wife 24/7 (my choice) from a stroke. My kids i have steered into health care thank god, and they are doing well, but will probably be forever in owning a house, or starting families. What is sad is to see the people(banks, hedge funds, private equity, the wealthy etc. ), who needed it the least get a do over(when they should have given all those houses to working people w a long payback, no sale for 20yrs(no flipping clause and you only get one), and a good portion going back to the government on resale.) The were plenty of smaller banks who would have picked up the slack with the behemoths dying. The most loathing people and institutions of the Fed, Greenspan, and Poulsen and his kind, and GS and other wolves and their kind really have taken us for a ride. I have protected me and my parents assets by not spending much, as there is too much risk to invest, and shame to all those who have hurt older retired workers by giving them no safe haven to put their money!!!. I bought my house in a smaller market. Where we will not have to build as high of walls if and when things go south. Really if we just had kept realestate at the historical growth rate of 1% annually for housing(not as an investment but a place to live), and gave people health care, and less fear and debt, we would have been way better off(people would have been happy to work for less if they are secure from being instantly poor from health or injury). Nothing is going to change until we have a revolution and no special interests and lobbyists. Can we all say Soylent Green coming!!!! Ps, also am a guy who has all his money out of system, and in local private secure storage. Good luck to those w theirs in banks. Wolfe and poster’s love your comments, and you are all right, less job’s for all, workers a dying breed in our expanding rentier society, thought we would learn that from Europe. Ps I just drove (if you can call it that, more like bouncing) 10,000 miles accross the USA in my handicaped class A rv(hospital on wheels), if you can call it that, roads and bridges terrible everywhere trucks go. Came home and will not do that again. The roads to Rome are truly crumbling. America is no longer great, we just have a better rule of law for the rats on a tread mill, and the big stick of the military industrial complex to (scare and war) when, well we must now, to make the economy go. Hold onto your children, they will need them soon!!!!! I truly live in a place that is growing, but like the world was 40 years ago (utah), and I am not mormon, but hush, don’t move here i have told my friends, you don’t want to be near the cult. No go live in Denver, Cali, Washington, Oregon, or some place that is totally over run, and fricken expensive, and crowded w way visable homeless, thank god for cults!!! Please stay away!! !